Wii Instruments are things such as, guitars, drums, bass, microphone, and I even saw a violin once as well! They are used in the famous games such as guitar hero, rock band, and the most famous Beatles Guitar Hero, songs and characters based off of the famous Beatles! All you do is just place the Wii remote controller in the spot in the instruments required, and then the instruments work! As for the microphone, that is extremely useful for the famous karaoke games made just for the Wii. So get your instruments today and rock out! Compatible with Guitar Hero and Rock Band games. No batteries needed, this guitar draws it's power rom the WiiMote. Connect MIDI compatible drums, keyboards and Squier Fender stratocaster guitar to your Nintendo Wii console. 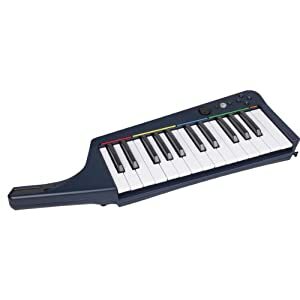 Rock out with this Wii keyboard for Rock Band 3! You can also use this as a MIDI keyboard controller when not playing Rock Band. Compatible with most MIDI sequencers. This collectible KISS Gene Simmons Axe Guitar is great for all Guitar Hero games! Features bi-directional strum bar, analog whammy bar and ultra responsive fret buttons.